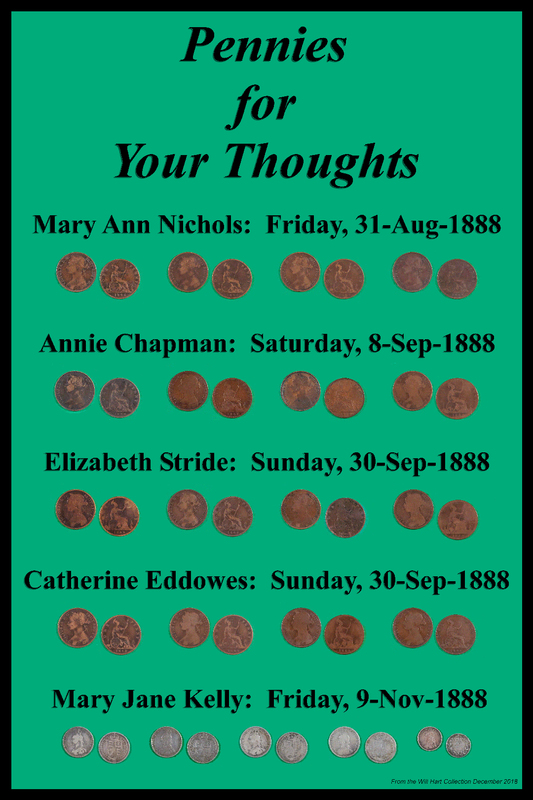 "Pennies for Your Thoughts: The Poster"
The full-size version is 27.1mb, and too large to pass around by email. I made it 7200 x 10800 pixels for printing a 24" x 36" poster at 300 d.p.i.. If you live near a Costco, they will print a beautiful copy for you for under $13.00, including tax. The "Thumbnail" I'm including with this message (if possible), or linking below, is 1080 x 1620 pixels; and just enough to give you an idea of how the poster will look. Hang one of these posters anywhere you'd like to start a conversation about "The Autumn of Terror," and the questions will begin. This poster is a companion piece to go with a 50-page document that I have written, entitled, "Pennies for Your Thoughts: Coins, and Their Purchasing Power in the Streets of Victorian Whitechapel." It is about the penny items available to the inhabitants of Whitechapel in and around 1888, and is organized in two parts. Part 1 is everything listed by price, and Part 2 is everything listed alphabetically. I have submitted the document to Adam Wood, in case he can use it for an issue of Ripperologist; and if he decides to not use it, I'll upload it to my blog, and provide a direct link to it there for everyone. I hope the poster means as much to you, as it does to me! Last edited by WillHart CthulhuWho1; 02-04-2019, 10:24 PM. It would appear from some of the responses I have received on numerous sites, that I need to clarify a couple of things about the poster I created. And then click on the picture there, and it will open up to its full size that you can download or scroll around on to see all of the details. The coins I have pictured in the poster, all from 1888, and all different coins from my meager collection, showing their fronts and backs for clarity, represent the rent money each one of the victims was trying to find at the time of their death. The first four victims each needed 4d (four Pence), for a Doss House (Flop House) bed for the night so they could get off the street. And Mary Jane Kelly, the last of the Canonical Five (others may have been killed before or after these five by the same murderer or murderers), was staying in a private room, where the weekly rent was 4s 6d (four Shillings and six Pence), or 54 Pence per week. The room she was living in with Joseph Barnett, who left her on October 30th., was in arrears to the tune of 29 Shillings (348 Pence!) at the time of her death; but it is most likely that she was just trying to raise at least one week's rent of 4s 6d when she met her end. As I have said in the original post, the poster is intended to open up discussions about all of the events and people involved in "The Autumn of Terror" and beyond; and I hope everyone enjoys this subtle way of bringing up the topic. Last edited by WillHart CthulhuWho1; 02-06-2019, 09:34 PM.